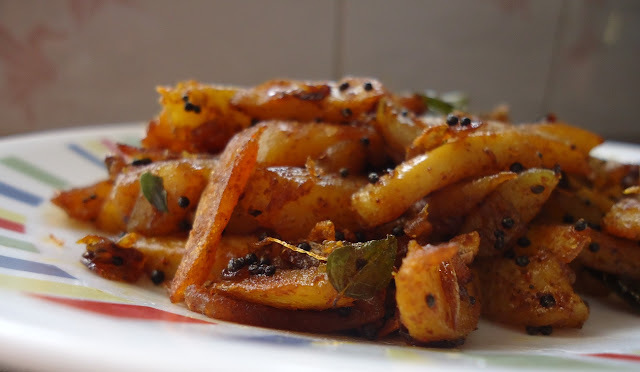 The perfect potato sauté or urulla kizhangu mezhukkupratti as it is called in Malayalam consist of thin long golden yellow juliennes of potato glistening with a light coating of oil and a sprinkling of small black mustard seeds. The golden yellow colour comes from using turmeric and chilli powder rather than the standard green chillies in mezhukkupuratti. 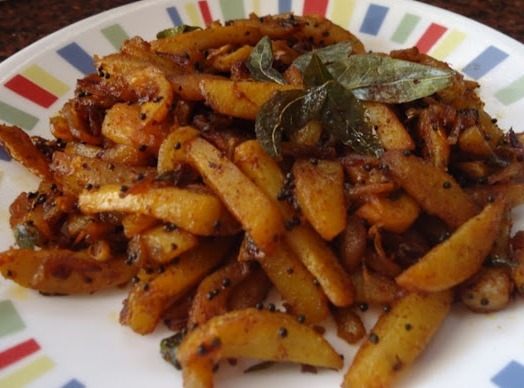 Crushed button onions and garlic add amazing flavour along with lots of curry leaves. Cut potatoes into thin long juliennes about 2 inches long and ¼ inch thick. Put them in a bowl of water to prevent discoloration. Heat oil. Add mustard seeds, when they splutter add the curry leaves and dry red chillies. After a minute, add the sliced button onions and crushed chopped garlic. Sauté for a minute. Add the potatoes, chilli powder, turmeric powder and salt. Toss well. Add more oil if needed. Sprinkle a little water. Cover and cook on low fire, stirring occasionally to prevent from sticking and burning. When the potatoes are cooked, turn up the heat and sauté for a few minutes till they are slightly crispy on the outside. Adding a little tomato sauce before the last step makes it a perfect side dish for chapatti. Hot rice, Moru Kachiyathu, Potato Mezhukkupuratti, Cabbage Thoran with some Kadumanga...I am already drooling. Give me a piece of fried fish and I will be in front of a feast for a King.